Did I overwater? Over fertilize? Can they be saved? Plants were transplanted starters from wal-mart put into the garden around 4/11. They include tomatoes, green bell peppers, banana peppers, eggplant, and cucumbers. Land was grass when we moved in the beginning of March. when I took this area, turned it over and covered it with black plastic for a month, turning it over once a week during that time and picking out grass and anything green. Before planting, I added a few bags of manure and some cheap top soil, turned it in a bit, and then built the raised rows you see in the pictures. Everything was planted same day, and I hit everything with one of those sprayer bottles of miracle grow (but didn't use it all, still lots left) that you connect to a hose. As of this morning, everything seemed to be moving slowly, but ok. I purchased some cheap Pennington 9-12-12 veggie/tomato fertilizer, and followed instructions, which was to sprinkle 2 tablespoons around each plant, and water thoroughly. 5 hours later, several plants including a couple tomato plants have fallen to the ground. Did I overwater? Over fertilize? Can they be saved or are they finished? Can I pull them and replant before it's too late in the season? Jeffross1968 wrote: Plants were transplanted starters from wal-mart put into the garden around 4/11. They include tomatoes, green bell peppers, banana peppers, eggplant, and cucumbers. Land was grass when we moved in the beginning of March. when I took this area, turned it over and covered it with black plastic for a month, turning it over once a week during that time and picking out grass and anything green. Before planting, I added a few bags of manure and some cheap top soil, turned it in a bit, and then built the raised rows you see in the pictures. Everything was planted same day, and I hit everything with one of those sprayer bottles of miracle grow (but didn't use it all, still lots left) that you connect to a hose. This all literally happened today. Those plants were standing up straight at 8am this morning. Can over fertilization show that quick? Jeff, from the pics it looks like you put the plants in the ground in those peat pots. I never do that even though the manufacturer says it's OK. I'd rather have the roots free from the get-go to establish in the new home. Also, with tomato plants, I like to bury them just about up to the new growth near the top of the plant. That way, the entire stem will set out new roots. Like mentioned already, your soil looks kind of packed. Organic matter is your friend. Compost is the way to go. Don't just fertilize for the sake of doing so. Get a soil test to see if anything is needed first. Just looked at the pics again and realized you put a ton of fertilizer almost directly on top of the plants. When the directions state put 2 tbs. around the plant, they mean just that, around the plant, not directly on top of the plant. If you're going to use that stuff, sprinkle it in about a 18" radius around the plant. I'd still get a soil test done first before using any commercial fertilizer. Your county agent or a local ag. school can likely do that or direct you to some place that does soil tests. gumbo2176 wrote: Jeff, from the pics it looks like you put the plants in the ground in those peat pots. I never do that even though the manufacturer says it's OK. I'd rather have the roots free from the get-go to establish in the new home. 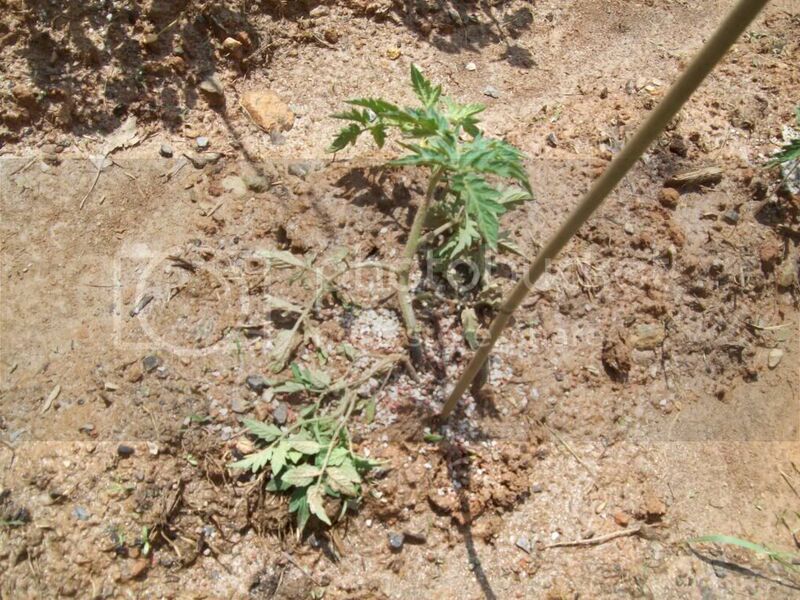 Also, with tomato plants, I like to bury them just about up to the new growth near the top of the plant. That way, the entire stem will set out new roots. I actually ripped off the bottom 2/3 of the peat pot. Maybe I should have removed them completely. That being said, all these plants were fine this morning. I plan on starting to compost soon, but was unable to do so for this year. We just moved into this house in March. Also, compost is no cheap thing to buy around here, and I really had to go cheap. The ground is pretty packed. I tested the soil back in late March, and it tested pretty low on everything. Added some lime before planting and turned it into the soil as best as possible. Other than that, the original shot of miracle grow fertilizer 3 weeks ago, and what I put on it this morning, I've done nothing else. Everything really was doing ok, but being a newbie, I figured some fertilizer would help. I certainly didn't think watering in some granules would cause this a few hours later. Really confused. I am not an expert nor do I use fertilizers, but the first thing that I noticed was the peat pots being buried with the plant. 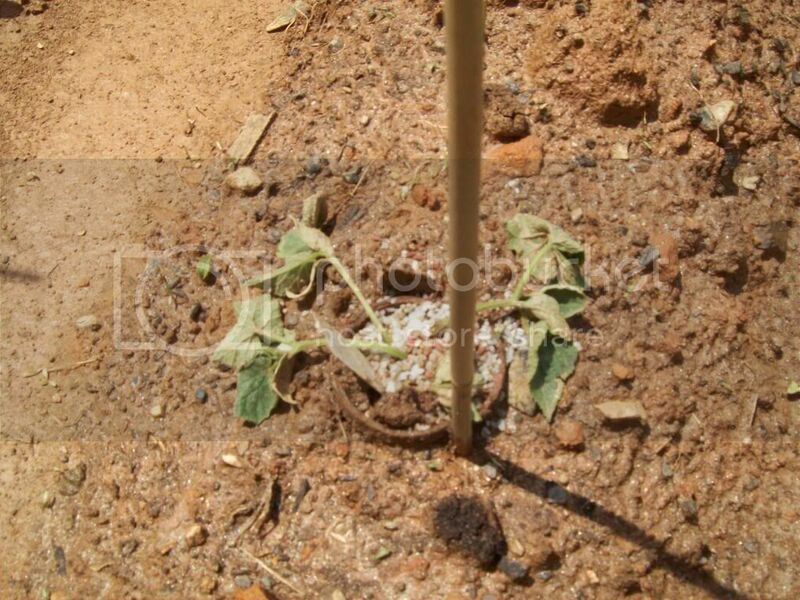 Is it possible, experts, that because the plants were buried in the pots, the fertilizer was trapped in the pot, over-fertilizing the plants, instead of spreading throughout the soil. Maybe that explains why it happened so fast. My plants look like that if I haven't hardened them off. Meaning, if they were covered with a tarp, and then suddenly exposed to the sun: the direct sunlight will shock them and send them wilting away. Did you harden them off before letting the sun get to them? To harden off is to let them be outside (keeping them in the shade for a few days), and then slowly let sunlight access them for short periods of time, slowly increasing the time incraments as the plant seems able to handle it (preferably starting with morning or evening light, not noon day sun). I don't know about the fertilizer stuff. I agree with gumbo. Chemical fertilizer salts like that should never be placed in contact with the plants. Or be so close. I think the concentration sucked the water molecules right out of the plants, especially if it was sunny. Kimbledawn has a good point too. I think you over fertilized. 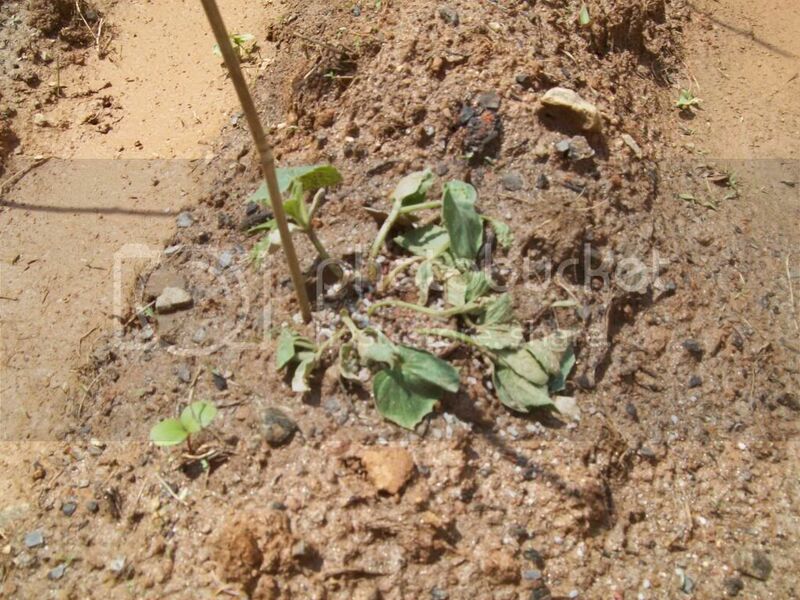 What happens when you put too much fertilizer on an area, the solution in the soil becomes more concentrated than the solution in the plant tissues, so the water migrates from the plants to the soil, and the plant wilts. It is nature's balancing act. The Fertilizer Salts are more dangerous than manure and compost. They can be easily overdone. Compost, manure, and all chemical fertilizers are just that, fertilizer, and should be used with wisdom and caution. "If a little is good, more is better", does not work here. I don't know that you can save those plants. I would till the area and water it deeply to help reduce the concentration of nutrients, then replant. Please, no more fertilizer this season. jal_ut wrote: I don't know that you can save those plants. I would till the area and water it deeply to help reduce the concentration of nutrients, then replant. Please, no more fertilizer this season. That is exactly what I had to do, unfortunately. About 1/4 of the garden lived. Everything else either died, or is on death watch. Everything that was completely dead was watered heavily, mixed with neutral soil and peat, and replanted. Luckily, we are still 1.5 weeks away from the "official plant date" for our area, so while I lost time, money, and some serious sweat, the season is not lost...yet. But good news is, it's not too late! I use 13-13-13 fertilizer granules like that, also, but i always wait until my plants are well established before fertilizing. And never put it directly on the plant, like the others said. I use the triple 13 because that's what my grandad and dad used, on everything from potatoes to corn. And, like the others said, you have to harden them off before exposing to sunlight and wind. What i did this year with tomato, squash, and cucumber seedlings was put a fan blowing on low for a half hour to hour a day, and then in the late afternoon i'd give them a little sun, gradually increasing the amount of sun over the course of a week. 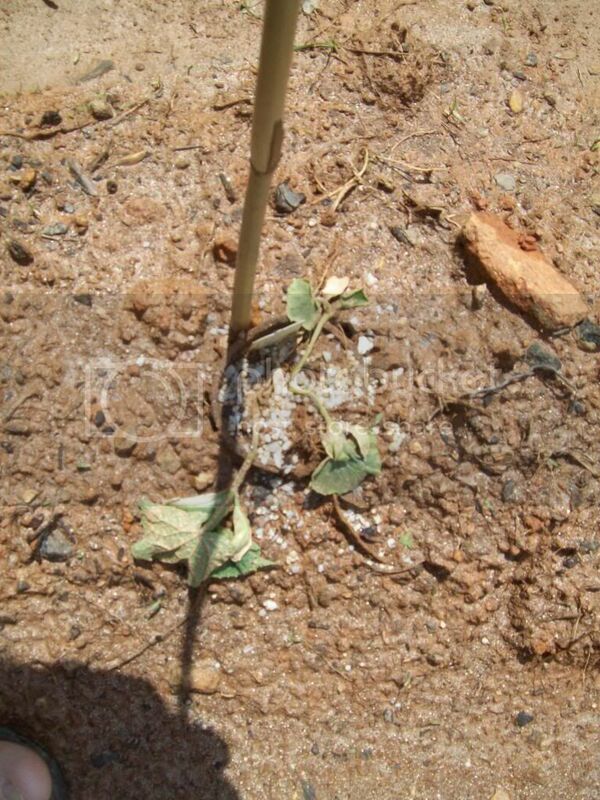 When the monsoon finally stopped, and i actually got to plant, the plants took right off without even drooping. You live and you learn, i'd buy some plants locally and set them out, give them a couple of weeks and then fertilize lightly, at least a foot away from the plant. This is just the way i do it where i live, find what works for you and stick with it! Good luck!